Qigong Meditation as I will define it here is based on the circulation of the natural energy of the universe through the student. Call it chi, prana, rlung, pneuma, or holy spirit, it matters not what you call it. It matters much more that we recognize it and utilize it to our benefit. This energy has a duality; yang & yin, megin & mott, shiva & shakti, sunlight and gravity. These energies are a part of our being; both physical and nonphysical. Zhan Zhuang is the fundamental standing meditation that aligns the body/mind to allow these energies to circulate in an unimpeded manner through the student. Using the metaphor of electricity, the circulation of the energies of the environment within the student, over time, clears the “blockages” that exist within the student. The body/mind is more easily able to absorb/discharge the yang/yin energies from the environment as needed.The result of this process is ever improving health, sanity, and vitality. It is my opinion that Zhan Zhuang alone is enough to give you back 20 years of your prime…it has done this for me. 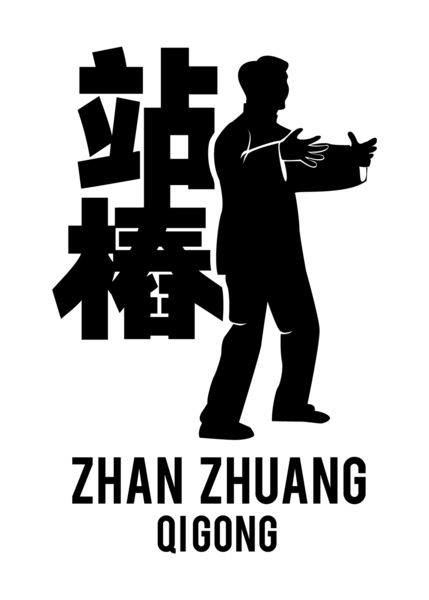 Zhan Zhuang can take several forms: In Ba Gua it takes the form of the circle walking. In Hsing I it takes the form of San Ti. In Tai Chi it is the standing pole. In Wing Chun it is Siu Nim Tao. The key point about Qigong Meditation is the concept of the body/mind being aligned in order to facilitate the circulation of this primal energy…in BOTH of it’s forms, yang and yin. Without the body/mind alignments; you got nothing. It’s like a computer that isn’t plugged into the wall. The hardware (body) and software (mind) have no juice to run on. You need juice. This is what distinguishes Qigong/Zhan Zhuang from other forms of meditation. Training the mind to be still is useful, but in Zhan Zhuang it’s a means, not the end. In our class we train stillness of the body/mind in order to perceive the ever present flow of “qi”, so we can facilitate it. This is why I stress that Qigong/zhan zhuang is better than other forms of meditation. It brings body/mind together with energy. Therefore it’s results are broader and deeper. I have tried other form of meditation. Most focused on stilling the mind, never progressing to using that state to facilitate the flow of energy. Qigong/Zhan Zhuang is about circulation. It is the best method I have found for achieving health, vitality, and sanity. It is also the foundation for Neigong (nei kung, nei dan) which uses the enhanced circulation achieved through Qigong to begin compressing the energy into the battery of the body. As the battery becomes charged, it is able to “turn on” various switches in the electrical system that are most often off. This is the path of the siddhis; a demanding and perilous path. But that comes later.